Background and objectives: The EAU guidelines recommend imaging for metastasis in men with Gleason grade group (GGG) 3 intermediate-risk cancer and in all men with high-risk cancer. The aim of this study was to develop a prediction model to better risk stratify patients and identify those who can avoid pretreatment imaging for bone metastasis. 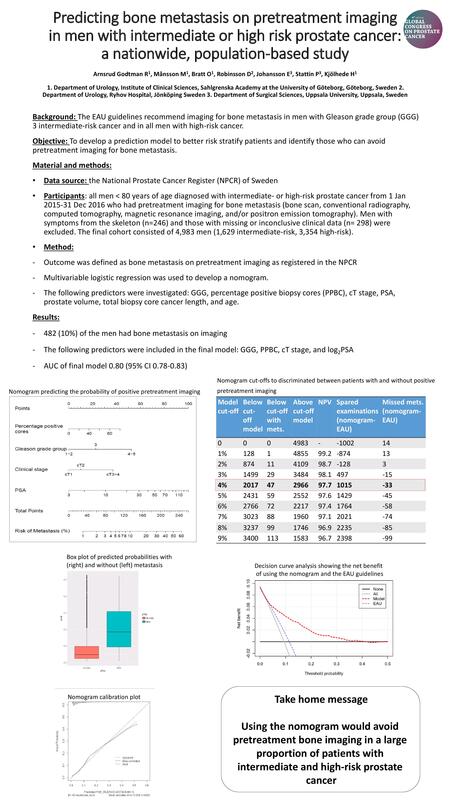 Material and methods: Data were derived from the National Prostate Cancer Register (NPCR) of Sweden, in which all men were identified who were < 80 years of age when diagnosed with intermediate- or high-risk prostate cancer from 1 Jan 2015-31 Dec 2016 and had pretreatment imaging for bone metastasis (bone scan, conventional radiography, computed tomography, magnetic resonance imaging, and/or positron emission tomography). Men with symptoms from the skeleton (n=246) and those with missing or inconclusive clinical data (n= 298) were excluded. The final cohort consisted of 4,983 men (1,629 intermediate-risk, 3,354 high-risk). The outcome was defined as bone metastasis on pretreatment imaging as registered in the NPCR. 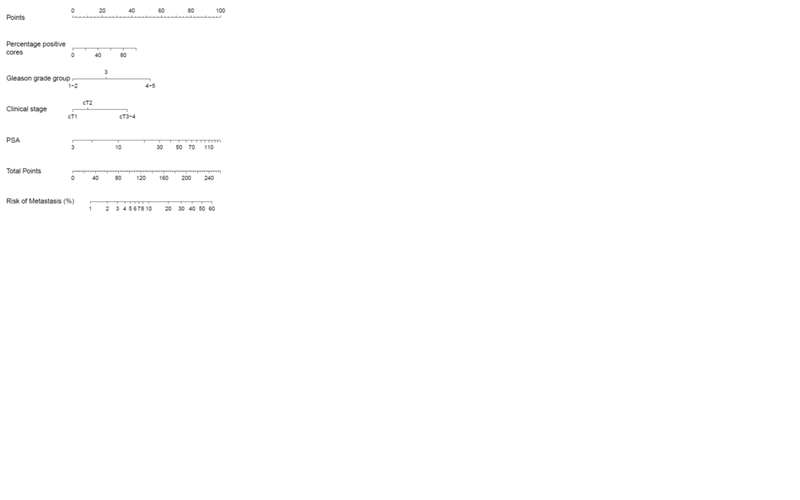 Multivariable logistic regression was used to develop a nomogram. The following predictors were investigated: GGG, percentage positive biopsy cores (PPBC), cT stage, PSA, prostate volume, total biopsy core cancer length, and age. Model performance was measured by area under the receiver-operating characteristics curve (AUC) and a calibration plot. The clinical consequences of using the nomogram was evaluated using decision curve analysis (DCA) and estimation of spared imaging. Results: 482 (10%) of the men had bone metastasis on imaging. The final model included GGG, PPBC, cT stage, and log2 PSA. Discrimination (AUC 0.80) and calibration were satisfactory. Using a nomogram cut-off of 4% metastasis probability would spare 40% (2,017/4,983) of the men with intermediate or high-risk prostate cancer imaging, and miss bone metastasis in only 1% (47/4,983). Compared with using the EAU criteria, the nomogram would avoid imaging in 33% and miss metastasis in 0.7% of the men. DCA showed a net benefit of the nomogram over the EAU guidelines, across all clinically relevant probability thresholds (range 1-41%). Conclusions: We have developed a nomogram to predict the probability of bone metastasis on pretreatment imaging for men with intermediate- and high-risk prostate cancer. Using the nomogram would avoid pretreatment imaging in a large proportion of patients.